Are you looking for a little hot somethin’ somethin’ to spice up your day? I’ve got two titles that are a Romance Review Top Pick with 5 stars. Chasing Faete is an action packed paranormal romance and Surrender is book number 4 in my science fiction romance series, Coalition Mates. You know what they say … you can’t run away from your fate. But what if your fate tries to run away from you? If you’re a wolf … you chase fate instead. Erica’s demons had finally caught up with her. After being on the run from her parents’ murderer for years, somehow her luck at evading capture had run out. The False King’s right hand man had her trapped …or so he thought! Poised to fight him alone, she is shocked when two wolf shifters come to her rescue in a dark ally. She doesn’t quite know what to make of them … but that could just be the blood loss talking. Leo and Ben couldn’t have been more surprised to stumble onto the scent of their mate as they were on a routine patrol. 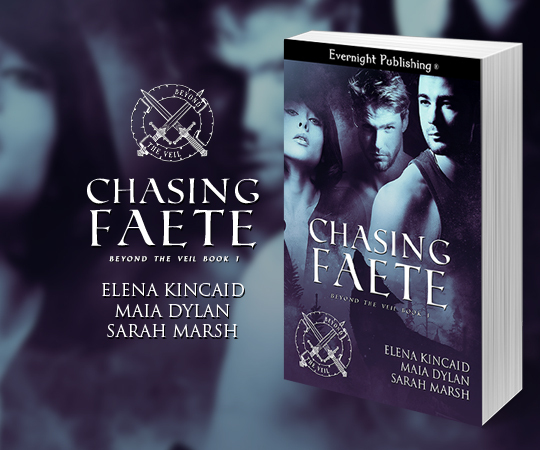 They follow their noses and barely find her in time, wounded and battling with a group of armed Fae. Little do they know, that life is about to get a whole lot more complicated when it comes to mating their little pixie. Erica can’t deny the bond she feels with both Ben and Leo. Will the need to avenge her parents’ death and the good of the entire Fae realm cost her the loves she’s waited so long to find? Or will new alliances and old friends come together in time to save them all? What would you risk to find your happy ending? Would you give the one thing you feared the most if the reward was more than you’d ever hoped for? SURRENDER by Sarah Marsh is a science fiction romance that will leave you wishing for more. When we meet Sally Owens, she’s just waking up from what she thinks is a “hangover to end all hangovers”. As the story begins, she’s replaying the events of the night before in her head. Except that she can’t remember parts of the night and oh yea, she isn’t on earth anymore. Sally and her best friend, Evie, were kidnapped by an intergalactic slave trader, but they were rescued before anything bad could happen. The bad news is that they can’t go home again. The good news is that there are delicious looking men who are more than happy to fill their lives with pleasure. When Sally is given the option to choose her future career, she chooses the Courtesan Guild and her training begins under the helpful tutelage of Arkenon, the guild master. This story was grand fun and I thoroughly enjoyed Sally’s struggles as she learned to let go, trust others and be honest with herself. And the way Arkenon goes about teaching her will leave you breathless for more. Lovers of sci fi erotica will enjoy this heady blending of the two genres into a well-told story that will have you wishing for more. When she goes out for a night on the town to troll for the new Mr. Right Now, getting kidnapped and shipped out into space was NOT what she had in mind. But above all else Sally is a survivor and she soon comes up with a plan to thrive in this new world. Arkenon Quinn, Courtesan Guild Master on the planet of Sirus, is informed that one of the new human refugees wants to join the Courtesan Guild and he was of course curious. However, when he meets the audacious and beautiful Sally he finds himself signing up to be the one to mentor her against his better judgement. What he could never have anticipated was how quickly this fascinating creature would steal his heart and force him to do something he’s never had to do before- chase a female. Will Sally’s painful past keep her from finding a future with the man who’s like no other she’s ever met? Or will she have the strength to place her body and soul in Arkenon’s extremely capable hands? 5 STARS at The Romance Reviews for Surrender, Chasing Faete and Dragon Trap!